Super Notes is an excellent iPad app that allows you to type or record your notes on the go. Super Notes is available for free today and only for a limited period of time. It’s regular price is $3,49. You can use Super Notes visually capture anything that picks your interest. Besides the ability to take written notes, Super Notes also enables you to make voice recordings and attach photos to your notes. 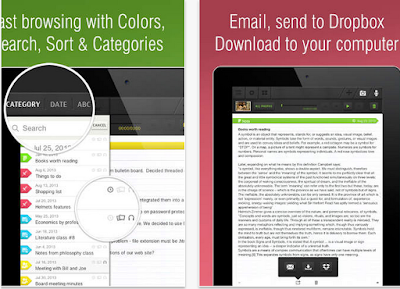 Other noteworthy features offered by the app: color coded note templates so you can organize and easily find your notes, sort notes by date, category or alphabetically, rapid search with instance search results, record and take notes simultaneously, set reminders on your notes, export your notes to Dropbox or share them via email.